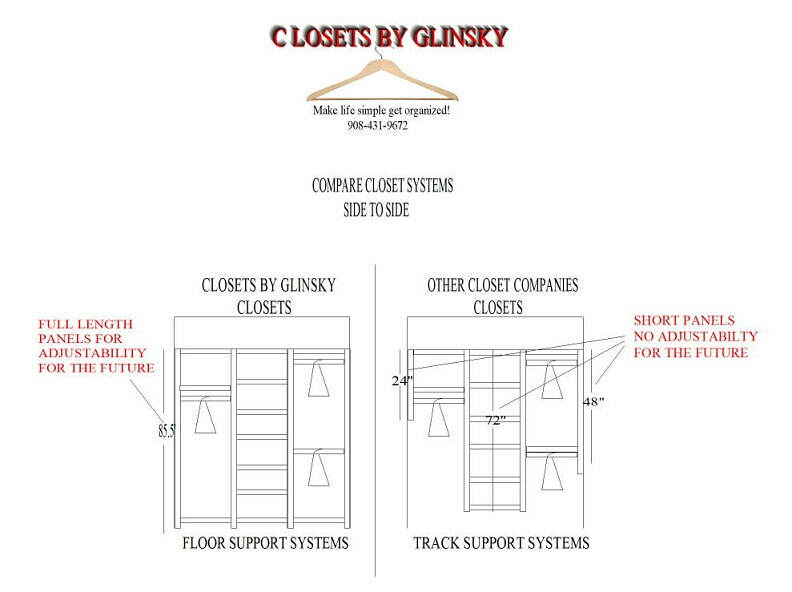 Closets by Glinsky is owned and operated by Don Glinsky who brings 25+ years of experience in closet design and installation. We are not a franchise operation. Our customers choose us for great quality, top service and for closets that will last a lifetime. We are happy to be serving Somerset, Hunterdon, Morris, Essex, Union and Middlesex counties in New Jersey. We provide many different design styles, finishes and accessory options to choose from to suit your particular style and needs. We are happy to provide a free closet design consultation as well as customer references - just ask! Mr. Glinsky is reliable, dependable and extremely responsible. He is entirely respectful of the customer's time and gets the job done with efficiency and IN A TIMELY MANNER! We very much appreciated his taking the time to share his expertise in designing closets which resulted in our maximizing the use of our available space. I highly recommend this superb professional! Don did a fantastic job on our 3 reach-in closets. He was honest, fun, and his work was very good. I found Don on Angie's List and I agree with all the A+ comments. We can't be happier with the closets. We had a very tight closet area and we are glad Don was able to be creative in solving the problem. He was punctual and neat. I would recommend Don to any neighbors, family, and friends. We are now able to use the space more efficiently. We are very happy! OMG!!! I absolutely love my new closet! I finally have all of my clothes and shoes in one place.....Don is a wonderful person to work with, he's thoughtful, efficient, fast, and nicely priced! Although, I don't like to share my specials "gems", I would definitely recommend Closets by Glinsky.